Another weekend and another trip along the New Jersey Turnpike. 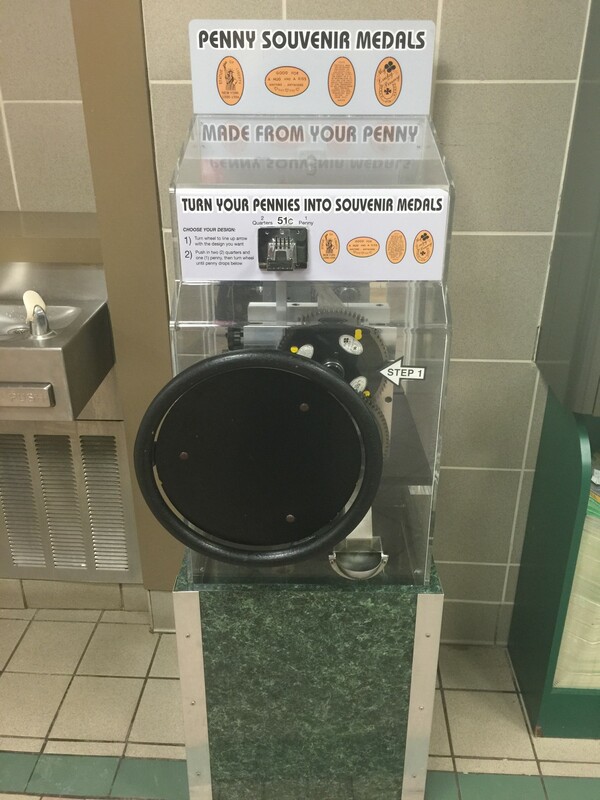 We didn’t have any specific plans but I was looking to revisit a nearby service area to see if the penny machine had changed. The good news what that the service area is pretty close to our house so I didn’t have to go too far out of my way to check it out, the bad news was that the machine designs hadn’t changed. The Molly Pitcher Service area is located on the southbound side of the turnpike between exits 8 (Cranbury) and 8A (Hightstown). On the first day of spring (a few days ago) we had received almost 6 inches of snow, but that didn’t seem to deter to many people from traveling the turnpike. There wasn’t any bumper to bumper traffic but the service area was busy with people getting a caffeine kick or an overpriced lunch. 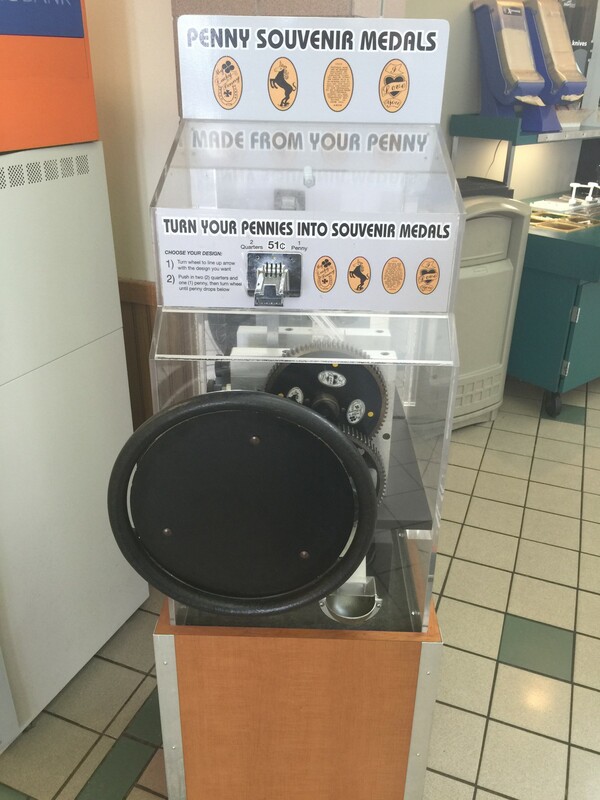 At all these service areas the penny machines are located either right by the main entrance or by the restrooms. As soon as I walked inside I saw the first machine right by the front door but someone was using it so I made my over to the restroom area and used this machine instead. The unfortunately issue with this machine being by the restrooms is that it’s in a high traffic area. There are almost always people hanging all over the machine or leaning on it while they wait for the rest of their family. A gentleman was standing next to the machine but he kindly moved out of the way as I walked up to press the designs. The machine works great and the man even leaned back towards me for a moment to see what I was doing. With the designs pressed I showed them to him and smiled. 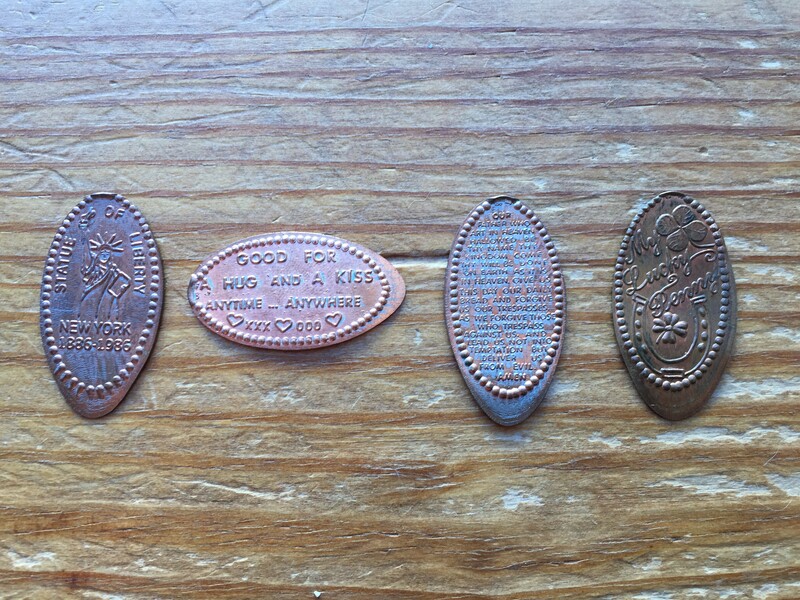 The designs from this machine had The Statue of Liberty, Good for a Hug and a Kiss (I’m definitely using this), The Lord’s Prayer, and a My Lucky Penny with a Shamrock on it. Next I moved back over by the main entrance and checked out the other machine. It was near some of the lines for the quick service food counters but I still had enough room to press the coins. This machine was also working great and pressed the designs nicely. 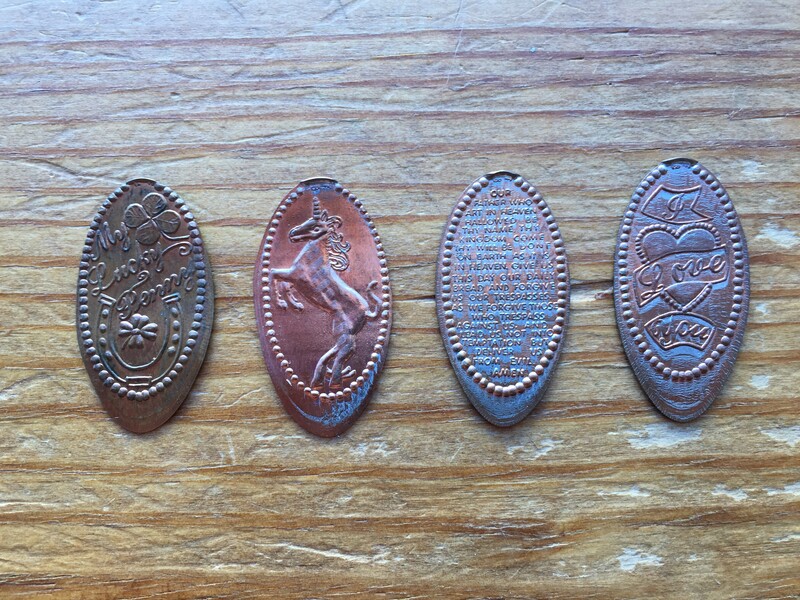 The designs included: My Lucky Penny with a Shamrock, a Unicorn, the Lord’s Prayer, and I Love You. As I mentioned in a previous post about these service area locations, many of the designs are the same. I believe there are about 16 unique designs in total but there are a lot more machines so duplicates are a guarantee. It was a nice little drive to the service area but seeing how busy it was I didn’t stick around longer than I had to. I grabbed a Starbucks coffee and jumped back in my car and headed home. I’m planning on checking out more service areas over the next few weeks and will report back on what I encounter. You never know what you may find on the Jersey Turnpike.